A scarf that equally celebrates "etoffes" ("fabrics"), this one depicts garments whose display is suggestive of bazaar merchants eager to show off all of their goods by "dressing" them on posts. 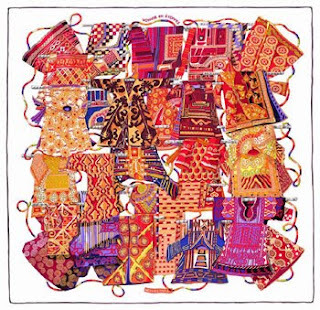 "Voyage en etoffes" ("voyage in fabrics") is an ode to the world's many cultures and the material expressions of those cultures through garments. From Europe to Asia and across to North America, every society has defined a standard for high-quality fabrics - cotton, linen, silk, cashmere, to name a select few. And equally defining is the variety of patterns - uncannily common to some nations - that create a profound harmony. Universal, garment art is an intimate expression for both men and women who aspire to look handsome. It is richly symbolic - the choice of the fabrics and the patterns speak for themselves, brandishing social status, a religious message or a ritual signature. Forever timeless yet classically fashionable. The colour combination of this particular scarf is impactful and very vivacious, and the design carries me to the image of my dear friend for whom the potential of fabrics to transform into adorning creations is indeed limitless. As a true testament to their nature, the names by which the "people of the wind" are known describe their history, peregrinations, occupations or territorial origins - or all of the above, together. "Gypsy" comes from the Greek for "Egyptian" in an erroneous belief that these people originated in Egypt and were exiled as punishment for allegedly harboring the infant Jesus. "Tziganes" comes from another Greek word, meaning "untouchables". "Bohemians", related to their obtaining passports issued by the Bohemian king, is yet another word, as is "Lautari" (from the Romanian "lauta" meaning "mandolin", denoting their admirable musical skills), "Kokkalaris" (from the Greek "kokkala" for "bones"), "Kalderash" (from the Romanian "caldare" denoting their blacksmith craft), "Ursari" (as "showers of circus bears") or "Rotars" (from "wheels"). No matter what their names, these people are universally recognized for their distinct caravans, select craftsmanship and sought-after instrument playing artistry. The design sports an intricate organic pattern, similar to the patterns of the Gypsy women's clothes, and has as a predominant motif the wheel, symbolic of these folks' peregrinations and fortune-telling. 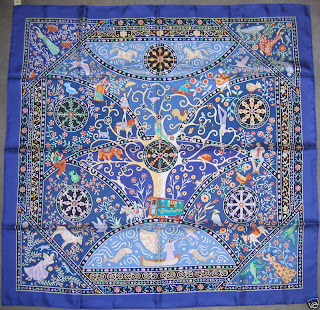 The scarf also depicts individuals as craftsmen and artists: male violin and accordion players, female dancers, horseback riders or circus performers are but a few of the individual elements. Equally fascinating is the representation of the legend of Sara, the Black Virgin of the "Roma" (the official name of these people since 1971). The colours in the series are all very bright, intense, unapologetic - similar to the vibrant colours of the folks' clothes. One of my favourite is the bright green, which I'll post as soon as I find a good picture of. 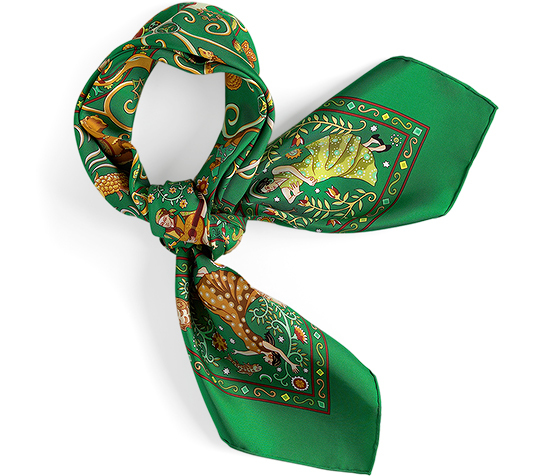 This scarf is a delight to wear as it ties beautifully and a great object of admiration for its own intrinsic story-telling design (albeit only for those who can wear "statement" accessories, as the pattern is quite strong and rich). The musical equivalent of this scarf would be Gheorghe Zamfir's "The Lonely Sheppard", which has invariable triggers misty eyes for me. This is a scarf that caught my attention first because of its interesting colour combination - bright orange hues on a white background - suggestive of the "blank canvas" concepts beloved by all entrepreneurs and inventors. Indeed, this scarf is a tribute to all pioneers who not only dreamt of flying machines, but also proceeded to realize their dreams, despite the odds of success. 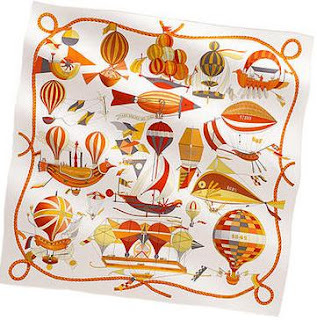 The tone of this scarf is not only of being mesmerized by the limitless power of the human imagination, but also of nostalgia, for those times immemorial of modest beginnings when the concept of aviation was in its infancy - a novelty reserved for a select few who could enchant the on-lookers and spur the imagination of countless others. 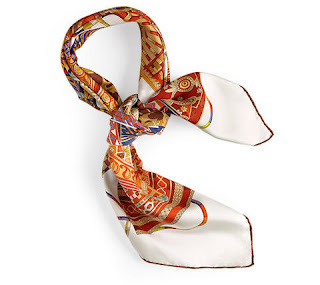 The spirit of this design dissipates when the scarf is knotted, yet this is another one of those memorable designs that deserve a prominent display in a study or an intimate room where the thoughts are allowed to wonder. This is a reissue of a "classic", although realized in more contemporary tones (the previous designs featured a contrasting fading border, which now makes it look a little antiquated). This scarf has been issued as part of the "grand voyages" theme, as a tribute to the French novelist and naval officer Julien Viaud, who rose to fame under his literary pseudonym Pierre Loti (one story tells of his remarkable shyness, which made his companions compare him to the Lotus flower - "le loti" - from where his nickname was derived). Pierre Loti has become synonymous with great adventures and the liberal spirit of pioneers. "Pierre Loti ou l'âme voyageuse" ("Pierre Loti or the traveller's spirit") is conceived as a collage of images depicting various scenes from the hero's life around the world - reminiscent of flashback memories - this design reunites the many lives and facets of the Frenchman: the young army recruit, the proud French Camel Corps soldier, the naval officer, the Turkish dandy and the eccentric Orientalist, to name a select few. Thanks to this innovative approach, this carre becomes a genuine exotic travel diary, recounting stories and giving wings to the readers. What captivated me about this scarf was not only the novel design of collage, but also the traveling and adventure themes, intrinsic in the pattern. I, too, grow wings with every thought of a voyage and while my forays into the unknown have not been as diverse or as rich as Pierre Loti's, I pride myself for having experienced countless cultures in some 18 countries on four continents and in this respect, I very much identified with this adventurers. Another very powerful aspect that resonated with me was the many lives and facets that make up an individual. I, too, consider myself complex, and when I introduce myself, I find it difficult to focus in on a single aspect of me. The clues almost exclusively come from my knowledge of my interlocutors, and their interests or preferences (my challenge has always been to encapsulate my spirit into a brief descriptions about me, because once I identify one aspect, I feel I automatically discard so many others). That is not to say that this scarf is a representation of me - I find it somewhat dissonant, in that it lacks a certain harmony (perhaps this was also representative of Pierre Loti, but unlike this, I aspire to harmony, so this adventurer cannot then become someone I aspire to be like). Given its strong (and strident) colours and contrasting images, and the vibe given by the collage approach, this scarf is suited for those who wouldn't shy from sporting strong contrasts, contrasting colours and patterns.